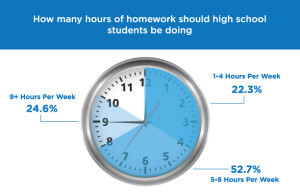 How Much Homework Should a High School Student Be Doing? According to a recent survey conducted by TutaPoint, experienced teachers have a lot to say about student many hours a high school student should be doing school work outside of school. Most of the teachers participating (91%) have over 10 years teaching experience. Math and science teachers from the northeast made up the majority of respondents. First, a majority (61.7%) believe that 70% of learning should be done at school, leaving 30% outside of school. Fewer experienced teachers (15.6%) believe that learning should be done 50/50 inside and outside of school, putting more pressure on students and parents. When it comes to the amount of homework high school students should be doing, 77.3% of veteran teachers believe that students should be doing at least 5 hours of homework per week. Almost a quarter of the veteran teachers that responded believe that students should be doing more than 9 hours of homework per week.